We are a cooperative of growers transforming our excess and unattractive fruit into delicious products for families to enjoy. Today, we’re still saving ugly and excess fruit – in fact more than 800 million pounds of fruit each year! Apples and pears remain our primary focus, but over the years we’ve expanded our expertise and capabilities to ensure we didn’t put all our “apples in one basket.” We now source all types of fruit from other growers we know and trust. We produce more fruits in more forms than any single source and you’ll find our delicious fruit products and ingredients in cereals, baby food, snacks, dairy treats, pet food and more. Behind Our Name: The Tree Top name has been associated with premium apple juice since 1946 when the owner of Charbonneau Packing, Bill Charbonneau, held an employee contest to name his premium juice which was marketed nation-wide. The Tree Top name was chosen as it was believed the best fruit came from the top of the tree. 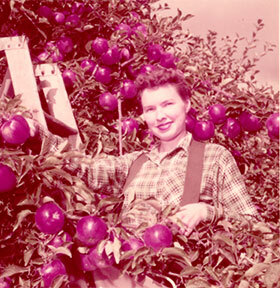 Not too long after, a group of apple growers got together to form our cooperative and to purchase Charbonneau’s company along with the Tree Top brand name in 1960. A stickler for quality and flavor: Over a half a century ago Bill Charbonneau, his wife and two sons moved from California to the Yakima Valley where he purchased a small apple processing plant on Produce Row in Selah, Washington. To differentiate his juice from others he sought the expertise of global experts in fruit processing. One of those experts was Carl Weisbrod, who has been credited with developing the process of making a shelf stable apple juice. Charbonneau also bought the first U.S. patent rights to a clear apple juice process developed in Switzerland. 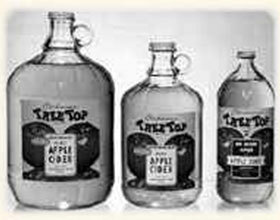 Tree Top apple juice quickly became acclaimed as the nation’s premium apple juice. Another thing that set the Tree Top brand apart from other apple juice brands was Bill Charbonneau’s discriminating standards. He was a stickler for great tasting juice. His office was located within the juicing facility so he could personally oversee its making. Apples were pressed and the juice stored in 5,000 gallon holding tanks. Every time a batch of apples was pressed, a sample was brought to Mr. Charbonneau to taste. If the juice did not meet his approval, the entire 5,000 gallon tank would be poured down the drain. Today, Tree Top retains the only trained taste panel in the apple juice industry to uphold our discriminating standard for great taste. Harvesting Growth with Local Fruit: While our expertise in fruit grew over the last half century as we learned how to turn fresh fruit into healthful products and ingredients, so did our company and our reputation. Our grower’s orchards are scattered throughout the fertile growing regions in Washington, Oregon and Idaho and we now operate eight facilities on the west coast close to where the fruit is harvested. These eight plants are capable of producing world famous Tree Top brand juices and the widest range of superior fruit products and ingredients available.